A bag of packaging aircrew of VFS5000H boxlike is one which our company develops newly to make one bag of models of boxlike, the wrapping bag increases by an angle of back cover on the vertical bag of foundations, make the three-dimensional effect of the wrapping bag stronger, the appearance is elegant in more appearance, make your products more attractive. 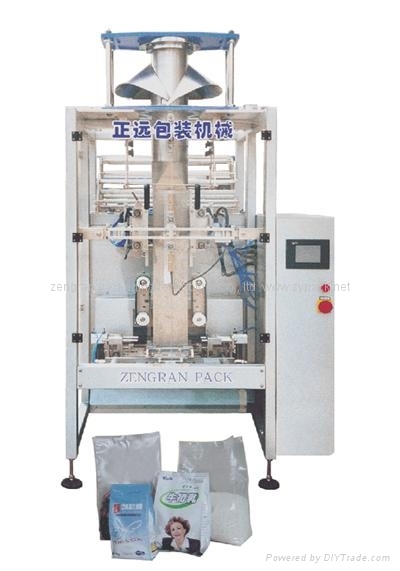 This packer is used to import the servo electrical machinery to leave the paper, the human interface uses the advanced technological touch-sensitive screen, enable operating more simple and more convenient. This aircrew produced the standard and researched and developed making for GMP , HACCP , QS ,etc. specially. A dozen countries and regions , such as the whole country , France , India , Pakistan , the Common Wealth of Independent States and Southeast Asia , Middle East , Africa ,etc..